Unfortunately neither Product Customizer, nor any other apps that modify the storefront product page, are compatible with the Facebook sales channel. This is because Product Customizer works by adding custom options to the storefront product pages, and the Facebook sales channel bypasses the product page entirely, meaning that your customers are never presented with those options. Furthermore the Facebook channel provides no way of adding these custom options or otherwise modifying the product listings on Facebook. We would love to be able to add our custom options to the Facebook product listings, however based on conversations with the Shopify team this seems unlikely to happen. A reasonable compromise would be if Shopify added an option to the Facebook channel to allow products to be shown, and link to the storefront product page. Even better would be if this option could be set on a per-product basis, so your non-customized products could checkout directly from Facebook, while the customized products would require the customer to return to the storefront to choose their options. 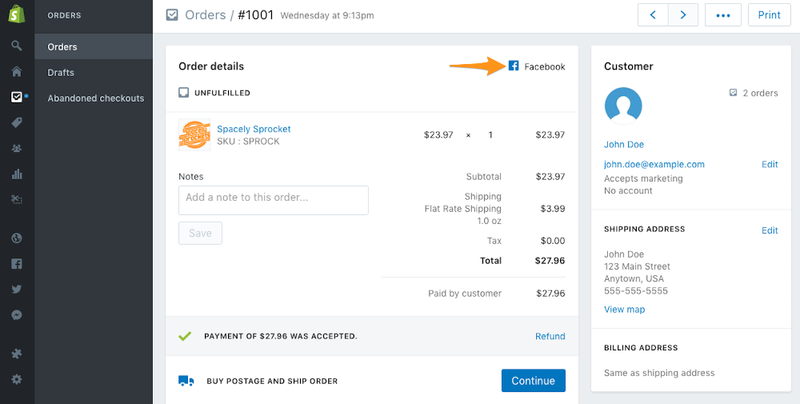 I'd like to request that Shopify adds a third "Checkout" option to the Facebook channel: link to storefront product page. Right now both checkout options for the Facebook channel bypass my storefront product page, which breaks any apps that modify the standard "add to cart" process, such as Product Customizer, which my shop relies on to collect customization information for my products. That means that my only solution for now is to remove my customized products entirely from the Facebook channel. I'd much prefer to at least have my products listed on Facebook, but direct my customers back to the storefront to provide their product customizations and then checkout. Is this something that Shopify could add?